Interview with the Archbishop Major of the Greek Catholic Church who speaks of at least two million displaced, thousands of victims, many children among the refugees and about a possible intervention from the Pope. The Pope may take concrete action” regarding the conflict that is devastating Ukraine, an international initiative to bring an end to the fighting. This is according to His Beatitude Svjatoslav Shevchuk, Archbishop Major of the Ukrainian Greek Catholic Church. 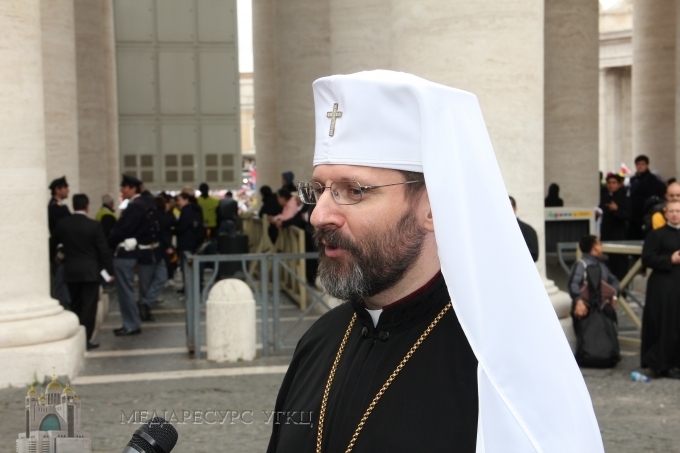 Bishops representing Ukraine’s Greek Catholic and Latin Churches were recently in the Vatican for their ad limina visits. Mgr. Shevchuk met the press and answered questions put to him by journalists. Amongst other things he stressed that the humanitarian situation is worsening as a result of the war and he reiterated that what is being witnessed in Ukraine “is not a local conflict, but an external assault”. He also said he informed Francis that the expression “fratricidal war” which he used in recent days “has hurt the sensibilities of the Ukrainians” as it seemed to echo what the Russians said about the war in Ukraine being internal conflict. Archbishop Shevchuk also mentioned the words the Pope addressed to Ukraine’s bishops - “I am at your side and at your service” - and pointed out that the Pope has undoubtedly played an important role in calling for an end to the Ukraine crisis, also in his recent conversation with German Chancellor Angela Merkel. The Greek Catholic bishop said he asked thePontifical Council for Promoting Christian Unity to encourage dialogue among the churches in favour of peace and praised the initiative taken in this direction by the World Council of Churches. He had some harsh words in store for Putin and Russian propaganda: “The chains of falsehood need to be broken the leader of the Greek Catholic Church said. “In Russia nothing is being said about the thousands of soldiers who have died in Ukraine,” he added. Mgr. Shevchuk, what is going on in Ukraine? What did you ask the Pope for during the recent ad limina visit? The Pope talked about respect for international law but he also asked bishops not to get involved in politics and spoke out against those who get rich by exploiting the crisis. How do you view this advice? There is a war going on in Ukraine, but what are the consequences on a humanitarian level? “The war always brings destruction and misery. The Ukrainian economy is really flopping and is facing a crisis. Officially, the UN has declared that there are a million displaced in Ukraine but church bodies tell us that this figure is in actual fact double. Almost 600,000 people have been forced to flee to other countries. The Ukrainian government is unable to manage this situation. I call this situation a humanitarian catastrophe on a scale that has not been witnessed in Eastern Europe since World War II. For this reason I have asked the Holy Father and various bodies of the Roman Curia to launch an appeal for humanitarian aid on an international level. We have managed to provide shelter to 40,000 people in our Ukrainian Caritas centres, but this is not enough: there are 140,000 children among the displaced and then there are the wounded. So in order to really save human lives we need solidarity on an international level." What concrete actions are you taking as a Church, as Christians? What was your reaction to the Pope’s appeal for possible peace?